Houzz 93 of our visitors have told a friend about this plan. This fantastic rustic cabin design will make the perfect vacation home. 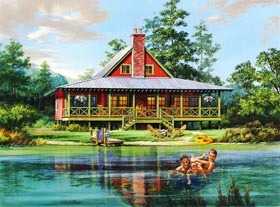 Sitting riverside or on the lake, this floor plan with its deep front porch and fireplace, is where memories are made. Question: Where would the mechanical closet be located? Answer: It would be based on the code for the area. 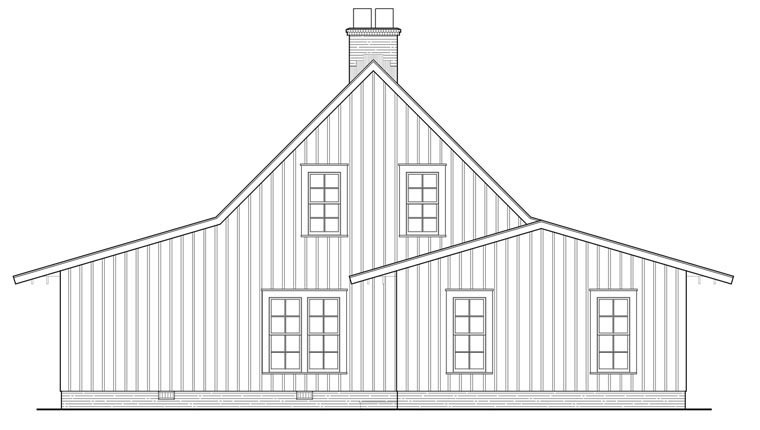 Question: My county requires a 4/12 roof pitch. Can I get blueprints for this? Answer: That would cause the entire 2nd floor loft would be considerably smaller. And there is a possibility that the stairs may not even work. Question: Is the 17' ceiling in living room a cathedral ceiling and is it 17' at peak? Answer: At this time, we do not have any finished photos of the interior. Question: Not sure how the stairs going up to the loft have enough clearance with the roof line? Do the stairs turn to the right at the top? If so how many steps? Question: what are the various ceiling heights i.e. main living space and what does it drop to in the kitchen; bedroom ceiling heights? Question: What size are the prints? Question: Does the set of blueprints include architectural drawings?Do the plans include structural and MEP drawings As well? Does it include specifications for the building of the house? Question: Do the elevations show the heights and all measurements? Click Here to download a free PDF Brouchure of Plan Number 86202.